Business View Magazine interviews John Ciniglio, President/Owner of Meyco Products, Inc. and TopTec Products, for our focus on the Domestic Pool & Spa Industry. The company had its beginnings in 1898, when Fred Meyer started manufacturing flags and awnings. Later, his son, Fred Meyer Jr., joined his father and the focus moved to residential exterior awnings. One day in the late 1950s, Fred Jr. was opening his swimming pool and found a dead skunk in the pool, his service company, a prominent pool builder in CT., asked, “Can’t you come up with a better cover to make this cleaner and easier with all that you know about awnings?” That motivational nudge inspired Fred Jr. to start working on a little project. 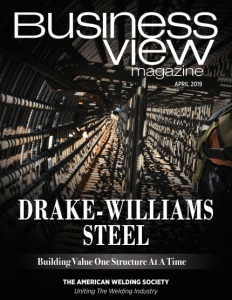 Being in the fabrics industry already, he tinkered with the idea of a cover that could be tensioned out over the pool and allow the water to drain. At the time, the biggest issue was the collection of water and debris on the tarp cover. 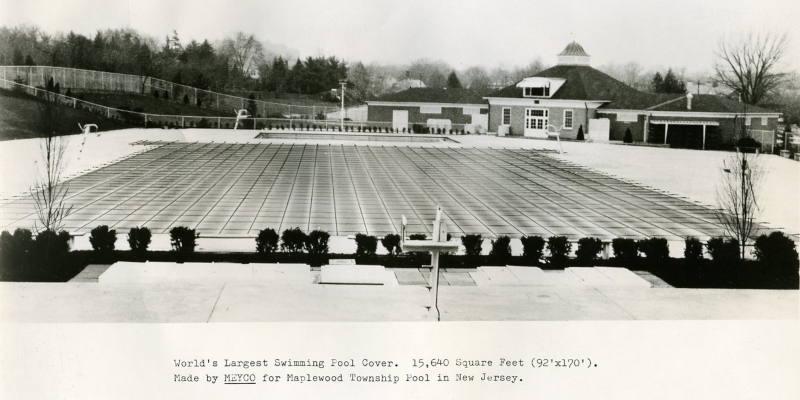 He devised a couple of prototypes and, in 1957, patented the first design of the winter pool cover which was to be anchored into the surrounding deck for maximum strength. Fred Meyer and Son would start to become known as Meyco, which was based in Long Island, New York and a second plant was opened in the late 1980s in Spartanburg, South Carolina. At that time, much of the textile business was leaving South Carolina and going overseas, leaving experienced sewing machine operators jobless. So, Meyco came to Spartanburg and offered a first shift; a fairly high-paying job compared to what they had been earning – a win-win for the company and the workers. Today, 99 percent of the covers are manufactured there. All the design work is done at Meyco’s New York headquarters, along with repairs and alterations, and some manufacturing of pool covers. Even when other companies make the product, the design is still Fred Jr.’s original creation with the crisscross straps, the hardware, and the anchoring system. It’s no longer proprietary – patents ran out a long time ago – but the design has lasted for decades and continues to be the most widely used and more popular cover design around the world. TopTec, on the other hand, manufactures mainly standard products. The SKUs are established in a catalogue and the customers choose the one they want. On occasion, the tent will be customized to accommodate a different pitch, or cutting around a certain area, or include print work. That reflects about 10 percent of the business. There is a seasonal push in the spring, from March to May, and supplying that demand requires inventory. TopTec invests well to have stock available, and if product does have to be made, it only takes one to two weeks. Event Tents are not all about fun and games; there is a serious aspect to the business. As Ciniglio reports, “We put on a Tent School at our facility, usually in December. With tents, the industry and insurance companies are very aware of the importance of safety. 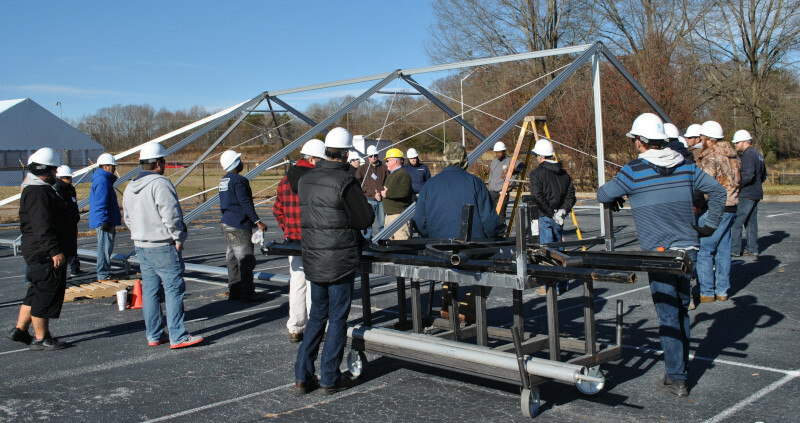 Teaching companies how to properly put up a tent, and the proper safety protocols, are vital from a safety standpoint, and just for managing your business. The efficiency of having a crew that understands the order in which it’s put up, or what to look out for at a jobsite, leads to a profitable and successful company. These are hard to demonstrate in a brochure or in a meeting at someone’s site. We’ve run Tent School longer than anyone in the industry and have companies from all over the country participating. It’s usually a three-day event where we touch on different methodologies for putting up frame tents and tension tents. It’s a great to way to share information, network, and learn something new.” The majority of TopTec customers are event planners, party planners, or rental companies. When they purchase a tent, they put it in inventory, typically for a wedding, or other large event. These companies are experts at installation and taking the tent down after an event. Check out this handpicked feature on Chem-Aqua, Inc. – Water treatment solutions specialists.